The ability to respond flexibly to the needs of customers is central in today's business world. In dental technology, too, rapid adaptability is required in order to remain competitive as digitalization progresses. The interaction between perfected craftsmanship and new digital workflows can increase efficiency and even enable dental laboratories to produce indications that were once uneconomical at their scale. Casting and pressing are crafts that have been developed over many years, and today, 3D printed patterns are making these techniques more efficient and scalable for more businesses. Stephan Kreimer, managing director of Kreimer Dentallabor and beta tester of our latest dental material, Castable Wax Resin, explains why the Form 2 desktop stereolithography 3D printer is a useful complement to his laboratory’s milling machine and how 3D printing makes the digital workflow for casting and pressing economical for dental laboratories of any size. Stephan Kreimer uses his in-house Form 2 3D printer for a wide range of restorations and has recently added Castable Wax Resin to his material library for pressing and casting. Two years ago, master dental technician Stephan Kreimer joined the management of the family-run Kreimer dental laboratory, which his father Wolfgang Kreimer had managed for more than 30 years. The generational change of the laboratory, which specializes in digital workflow solutions, can be traced back to its adaptability: continuing the tradition of producing high quality, hand-crafted restorations under modern demands. &ldquo;Today, a laboratory with a milling machine and a 3D printer can produce any restoration out of any material. 3D printing completes our portfolio of manufacturing options—we don't need to outsource any more products,&rdquo; says Kreimer, who with nine employees uses a Form 2 3D printer alongside a milling machine for a wide range of restorations. Mid-sized, full-service laboratories such as Kreimer Dentallabor need to stay competitive in a market that demands lower prices at a higher output. For Kreimer, going digital doesn’t simply mean producing everything as quickly as possible and at the lowest price. It means striking a balance between the most efficient manufacturing method and the highest quality while maintaining flexibility and the best patient care. Dental milling machines can be very expensive to own and maintain, forcing many dental labs to make restorations traditionally or rely on outsourcing partners. With neither 3D printing nor milling within grasp, many dental labs leave certain indications out of their digital workflow and stick to time-consuming conventional manufacturing methods. With Formlabs Castable Wax Resin, Kreimer found the most economical and high quality solution for his laboratory’s casting and pressing needs, the only indication they had not yet digitized. Accessible, affordable 3D printing on the Form 2 has enabled the lab to digitize removable partial dentures (RPDs), one of the most labor intensive products, for the first time. Before 3D printing complex RPD structures in Castable Wax Resin, Kreimer prepares the prints in intuitive Formlabs PreForm software. Using patterns 3D printed in Castable Wax Resin has enabled a new level of efficiency while retaining the quality and craft of the analog casting process. &ldquo;You get a process reliability that you don't have with modeling: if something needs to be remade or doesn’t come out as intended, you just re-print the pattern and re-cast it. It’s easy to make changes and reprint the part without starting the entire process over,&rdquo; Kreimer said. Read our Application Guide for design guidelines, burnout schedules, and a step-by-step look at how to work with Castable Wax Resin, or request a free sample part to try it for yourself. A complete setup for 3D printing Castable Wax patterns: the Form 2 desktop stereolithography 3D printer, Form Wash automated wash station, a cartridge of Castable Wax Resin, and a build platform of printed parts. When Kreimer Dentallabor received the first digital impressions of their customers' implant work, they were still using external services to create models. &ldquo;That was expensive, but the worst part was the loss of time. We couldn't continue our work because we were waiting for the parts to be delivered. The reasons why we use in-house 3D printing today are not so much about saving cost, but about saving time and adding value to our own laboratory,&rdquo; Kreimer said. Initially, Kreimer bought a 3D printer because dentists started sending digital impressions that needed working models. The lab began printing these models in Dental Model Resin. 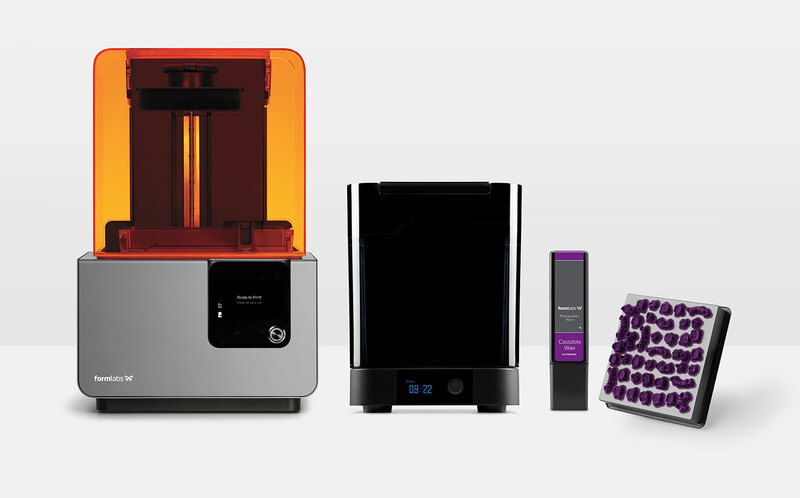 With the eventual addition of specialized materials like Castable Wax Resin, the Form 2 exceeded expectations and became a critical part of production for many indications. A removable partial denture pattern printed in Castable Wax Resin and telescopic copings. Through 3D printed patterns, Kreimer has increased the efficiency of internal production enormously, improving the tried-and-true methods of dental technology, while still having the efficiencies of CAD and 3D printing. In calculating weighted cost, Kreimer included cost of materials and labor that would otherwise be performed by the outsource provider. &ldquo;Castable Wax Resin can perform sharp-edged preparations and pressable ceramics. Pressed crowns are as good as milled ones, and can reproduce even finer structures,” Kreimer said. For Kreimer, there is no "either or&rdquo; choice between 3D printing and milling: the choice between 3D printing and milling is based on what is best for the patient and the doctor. &ldquo;For those who do not have a milling machine, Castable Wax Resin is a major step forward, the first step for crown and bridge work,&rdquo; Kreimer said. At Kreimer Dentallabor, the combination of analog casting and digital data and master mold production offers the best balance of efficiency and quality. &ldquo;Castable Wax combines the best out of two worlds: The predictable, replicable planning of the digital workflow and the comparably affordable manufacturing process of analog embedding and casting,” Kreimer said. As the number of crowns, bridges, and removable partial dentures prescribed each year increases, the number of dental labs and technicians has continued to decrease, so efficiency is key. Formlabs is excited to introduce a more efficient, scalable workflow and more accessible price point for casting and pressing patterns.